This afternoon I was cutting corn off the cob so I could make a nice summer salad. We’re at the tail end of a very hot, very humid stretch of weather right now and the corn/humidity combo made me think of the food I grew up on. Back then, my mother either froze or canned every bite of food we ate. I have no idea how she and all the other women managed to do this, but that’s how it was. Every year when it’s time to put up our fresh sweet corn signs, I know that summer is truly here. Yay! Sweet corn! Why do so many of us have such a strong love of Zea mays var. Saccharata, the scientific name for sweet corn? It’s quite simple really. It tastes SO GOOD! Plus probably many of us have good memories of eating sweet corn as a child. Carefully clearing off row after row, cob after cob of the tender sweet kernels. And could our early enjoyment of sweet corn possibly be linked to the fact that we were actually encouraged to pick this vegetable up and eat it….using our hands? Maybe turnip would be more popular if it had this eating rule. Another fun thing about sweet corn is the names of the varieties of sweet corn. Consider these tasty-sounding names from this year’s Stokes Seed Catalogue: Luscious, Delectable, Fantastic, Awesome and Gourmet Sweet. Who wouldn’t want to eat a vegetable with fun and delicious names like these? This year we have three varieties of sweet corn planted in sequence for harvest between the end of July and the end of September. Our early corn is called Navajo (an interesting name and a great early corn) and the other varieties are Gourmet Sweet 274 and Gourmet Sweet Awesome. My personal favourite is the Gourmet Sweet 274. It has large cobs, very tender and is very–delicious! The sweet corn crop this year looks fabulous, (hey that’d be a great name for a sweet corn variety) so keep the butter handy, the salt close at hand and get the water boiling. Early sweet corn grown in SW Ontario is now available at Reesor’s Market & Bakery (by the half-dozen in brown paper bags) and and at Reesor Farm Market. Our own corn will be ready in late July. 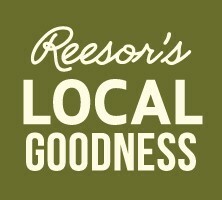 It was a great year for strawberries at Reesor’s. Thanks to all the u-pickers and customers who bought ready-picked berries. This year we had a strawberry themed photo contest on Facebook and Alanna Lloyd of Stouffville, won the grand prize of a flat of strawberries, a cake and whipped cream. We also had an end of season strawberry grazing party and mini-music fest (pictured above) and raised $411.65 for the Whitchurch-Stouffville Food Bank. Please follow us on Facebook, so we can keep you informed about other events we’ll be having in the future. This dessert may become a staple in your repertoire. You don’t need to tell anyone how easy it is to make. Preheat oven to 375. Put the butter in a 3-quart baking dish (casserole dish) or in a 10 inch or 12 inch oven-proof skillet. Put the pan in the oven to melt the butter while the oven is preheating. Stir together the flour, sugar, baking powder and salt in a medium bowl. Add the milk and stir until combined. A few small lumps are ok. The batter will be runny like a cake batter. When the butter is melted, take the baking dish out of the oven and pour the batter over the melted butter; do not mix. 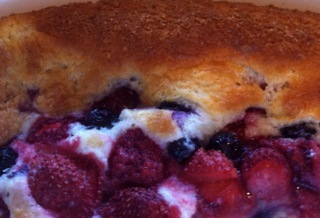 Scatter the fruit over the batter, favouring the middle of the dish more than the edges; do not mix it in. Bake until the top is a rich golden-brown, 30 to 40 minutes. Serve warm with ice cream or whipped cream. Adapted from a recipe in Fine Cooking Magazine, Aug./Sept. 2013. Are you a Golfer or know one? Here’s a chance to golf at a top local golf course, dine, and raise funds for one of our favourite Markham charities, Willowgrove, which operates Glenbrook Day Camp and Fraser Lake Camp. $250 for golf and dinner, $65 dinner only. Have you been enjoying our popular “Country Flavour” jarred peaches and wondering who does the work to can those delicious “Baby Gold” peaches? Melinda and Edna Brubacher are the young women who started Country Flavour in 2008 and who keep Reesor’s supplied with jarred applesauce, cherries, chili sauces and other preserves. Their home with its separate, small-scale commercial cannery is located in Ariss in Wellington County near to the town of Elmira in Waterloo County. The Brubachers have already been busy this summer canning beets, zucchini, and asparagus and are now starting cucumber pickles. Most of the food they preserve comes from their own or their parents’ garden and other farmers in their area. Their busiest time is still coming when the three sisters and three other friends will be canning peaches in the very warm and steamy cannery. Edna is happy in her work. “I enjoy making all of the different products for our customers and I like working with my sister Melinda,” she says. She’s also pleased that another sister is now working with them too. Because they preserve local produce it means they have to can or freeze the fruits and vegetables during the Ontario growing season, but the Country Flavour kitchen is busy year-round. In the winter they use the frozen fruit to make jams and jellies and to make their very popular pickled eggs. With so much supermarket food now imported from the US or China, Reesor’s believes that it’s important to keep demand high for peaches and other fruits and vegetables from the Niagara Region and other parts of Ontario. This can help maintain land for agriculture and keep small-scale businesses such as Country Flavour viable supplying Ontarians with locally grown and preserved food through the winter as an alternative to imported, out of season fruit. Because Melinda and Edna are members of the Old Order Mennonite church they don’t own a car or truck to deliver their jars of preserves. Salome, the manager of Reesor’s Market & Bakery, drives to Country Flavour a few times a year to pick up boxes of preserves to bring back to to Stouffville. Salome enjoys the journey to Ariss going along the back roads and seeing the tidy farms and gardens of the Old Order Mennonite families. She likes visiting Edna and Melinda because they are such friendly and down to earth people. The Country Flavour cannery is on the right. A family member’s horse and buggy is waiting out front. Old Order Mennonites are Christian, pacifist believers who have kept many traditional theological and lifestyle practices. They do adapt technologies that are required by regulation and practicality, such as the Brubachers’ commercial kitchen equipment that would be the envy of most home-canners. The cannery in the Country Flavour commercial kitchen. Part of the beliefs of Old Order Mennonites includes not taking photographs of themselves, neither men nor women. So, we can’t share a photo of the sisters. Next winter it will be like a breath of fresh summer air to be able to reach for a jar of Country Flavour preserves and know that it comes from Ontario and the careful work of Edna, Melinda, their family and other Ontario growers. Woolwich, Waterloo and Wellington Counties have many interesting and scenic areas. Here are links to some of the highlights and a link if you are interested in knowing more about Old Order Mennonites.